About 100,000 people attended the ceremony in Mexico City. The defeated left-wing candidate in Mexico's presidential election, Andres Manuel Lopez Obrador, has held an unofficial swearing-in ceremony. 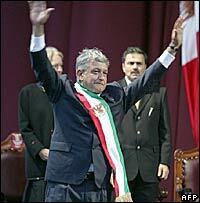 During his "inauguration" in Mexico City, Mr Lopez Obrador said he was launching a "parallel government". He claims he was the victim of fraud in July's election - a view shared by millions of Mexicans. But some of his supporters think his alternative inauguration is ill-advised and politically irresponsible. In the presidential election, Mr Lopez Obrador was defeated by less than a percentage point by Felipe Calderon of the governing National Action Party (PAN). Mr Lopez Obrador was "sworn in" by Senator Rosario Ibarra, a human rights activist and member of his party, who placed a red, green and white presidential sash across his shoulders. Mr Lopez Obrador insists he won the July election. "I pledge to serve loyally and patriotically as legitimate president of Mexico," Mr Lopez Obrador said before an estimated 100,000 supporters in the Zocalo, Mexico City's main square. "I pledge to protect the rights of Mexicans and to defend Mexico's sovereignty and patrimony, and ensure the happiness and welfare of the people." Mr Lopez Obrador has promised he will do everything he can to hamper the government of Mr Calderon, who succeeds President Vicente Fox on 1 December. "Those neo-fascist reactionaries better not think they'll have room to manoeuvre," he told his supporters on Saturday. "We're going to keep them on a short leash." Although Mr Lopez Obrador has enough of a support base to be able to create a mass civil disobedience movement, some analysts think that his campaign will be, at best, a thorn in the Mr Calderon's side. A source close to Mr Calderon told Reuters news agency the president-elect would announce the names of some of his cabinet members on Tuesday morning. Mr Calderon would then present a message to the media at 0800 (1400GMT) but the source would not disclose the details. The BBC's Americas editor Will Grant says many Mexicans are tired of conflict and long for a return to normality. Some of Mr Lopez Obrador's advisors privately agree that it would be the politically expedient move, especially with an eye on any future presidential bid, our correspondent says. What next for divided Mexico?